The pupils and teachers along with parental helpers undertook research into their parish of Oyne. Cartographic evidence led to the recognition of a formerly unrecognised late 12th century estate boundary dividing the lands of Ardoyne from Oyne. This survives still as an almost complete line of present field divisions. Cartographic study also led to the development of a hypothesis that an early settlement focus was centred upon the presumed site of the former castle of Hart Hill prior to its move to its present site. It was decided to test this idea by means of sampling a field lying to the west of the presumed castle site. This was done by gridding the field and shovel-pitting and sieving at 10 metre intervals. Approximately 1,000 litres of soil was sieved and inspected by the school and the Mediaeval pottery was found to form a distinct distribution at the east end of the field - the end nearest to the supposed castle site. The finds were washed and the results plotted. Work is progressing on the cataloguing of these finds. The pupils of Oyne took part in a workshop laid on for them at Kings Museum where curatorial skills were discussed. Liz Curtis helped the pupils to populate the ‘cabinet of curiosities’ and to put on an exhibition for the community which formed a part of Oyne’s Jubilee celebrations. Work will continue next year to try to further understand the Mediaeval development of Oyne. 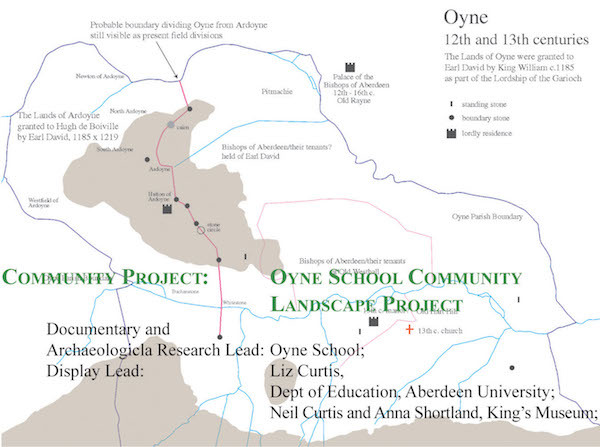 Oyne primary school community landscape project Oyne school community project has revealed evidence of oyne's medieval development. sherds of 13th/14th century pottery appear to demonstrate firmly the existence of a castle and/or settlement on old hart hill at that time. the study of the distribution of standing stones, cairn and a stone circle in oyne parish has revealed the survival of a boundary that appears to have been in use since at least the end of the 12th century. it was used at that time to divide oyne into two smaller lordships. one portion was retained by earl david whilst the western part was enfeoffed to hugh de Boiville. whether the boundary preceded that date and was simply re-used is, at present, unknown. The pupils and teachers along with parental helpers undertook research into their parish of Oyne. Cartographic evidence led to the recognition of a formerly unrecognised late 12th century estate boundary dividing the lands of Ardoyne from Oyne. This survives still as an almost complete line of present field divisions. Cartographic study also led to the development of a hypothesis that an early settlement focus was centred upon the presumed site of the former castle of Hart Hill prior to its move to its present site. It was decided to test this idea by means of sampling a field lying to the west of the presumed castle site. This was done by gridding the field and shovel-pitting and sieving at 10 metre intervals. Approximately 1,000 litres of soil was sieved and inspected by the school and the Mediaeval pottery was found to form a distinct distribution at the east end of the field - the end nearest to the supposed castle site. The finds were washed and the results plotted. Work is progressing on the cataloguing of these finds. The pupils of Oyne took part in a workshop laid on for them at Kings Museum where curatorial skills were discussed. Liz Curtis helped the pupils to populate the ‘cabinet of curiosities’ and to put on an exhibition for the community which formed a part of Oyne’s Jubilee celebrations. Work will continue next year to try to further understand the Mediaeval development of Oyne. The pupils have now started work shovel-pitting a triangular field next to the graveyard below the field sampled last year. It is hoped that further evidence will be forthcoming relating to the early settlement history of the village.